It would be cool if third-party apps came out that allowed us to edit game files. In Madden 08 you could load your franchise file into an editor and edit entire draft classes before the draft. You could do the same with the rosters in franchise mode. Just a couple clicks and edit a number in a box. Way easier than navigating all the menus in game. This game got a complete overhaul man. Madden 19 has changed that logic so only defenders with 99 zone coverage break on the ball everytime before a QB releases it. Players with 90-99 zone coverage have a chance of breaking on passes early with the likelihood of that happening scaling up as the player’s zone coverage rating gets higher. 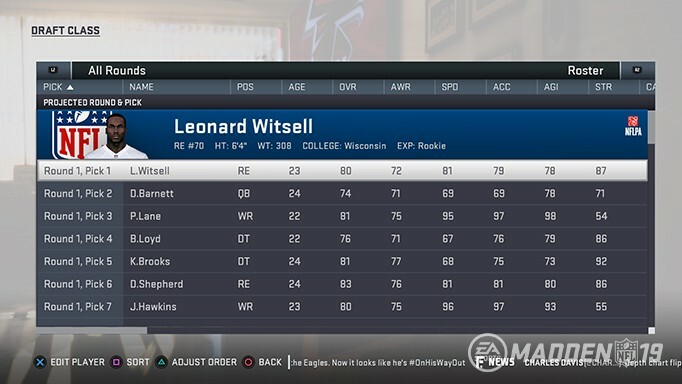 There are a few other changes to defensive player logic in Madden NFL 19. The primary of focus with Cover 2 was adding new rules and logic for the Middle Read and Vertical Hook defenders. The Middle Read player will now do a much better job of getting to the deep middle of the field to defend against pass routes that cross that area. Cover 3 will defend against trips and bunch formations much better than before. In those situations plays like Cover 3 Match, Cover 3 Sky, and Cover 3 Buzz plays will function more like the Cover 3 Mable. There are 2 new cover 4 defenses in Madden 19 (Cover 4 Quarters and Cover 4 Palms). The protect the sticks feature that has been broken for the past few Madden NFL games is fixed so that the underneath defenders will drop to the first down sticks. A new formation called Big Nickel G has been added to this year’s game. It is a 4-2-5 defense which will be found in every Madden 19 defensive playbook. So basically you can't just spam points into whatever rating you want. I think I like this more. It's going to make franchise a lot harder. If you edit the current class, then you will be taken to a spreadsheet that reveals everything about the 450 players in the current draft class. Easily move players up and down the draft projection using the “swap” and “insert above” tools. Select each player and edit his Player Info, Appearance, Equipment, Ratings, and Player Traits. I just read an article that the Chiefs are 80 overall. I'm pretty sold on it. Madden 19 looks good. Far from where it can be, but still not bad. Offense was an 81 and defense was an 81 based on their ratings apparently. Meh, we'll see. I've also seen a video that showed Kelce was rated 83 overall. So I wouldn't look too deep into it. I haven't played Madden since 2008 but the leaked ratings seemed pretty low compared to that year. And the second best rated team is 84? Don't think I've seen that in any Madden. Ever. I hope I get a gift card to gamestop for my birthday (I usually get some sort of $ to gamestop from relatives). wouldn't mind picking this up for 'free'. will probably feel exactly the same game play wise; connected franchise as a player will still be broken; and AI will likely be horrible as always. Free? I'll pick it up. but doubt I'll shell out money on it new; maybe wait a few months and pick it up for 1/2 price. I'll be too busy geeking out on RDR 2 anyway.